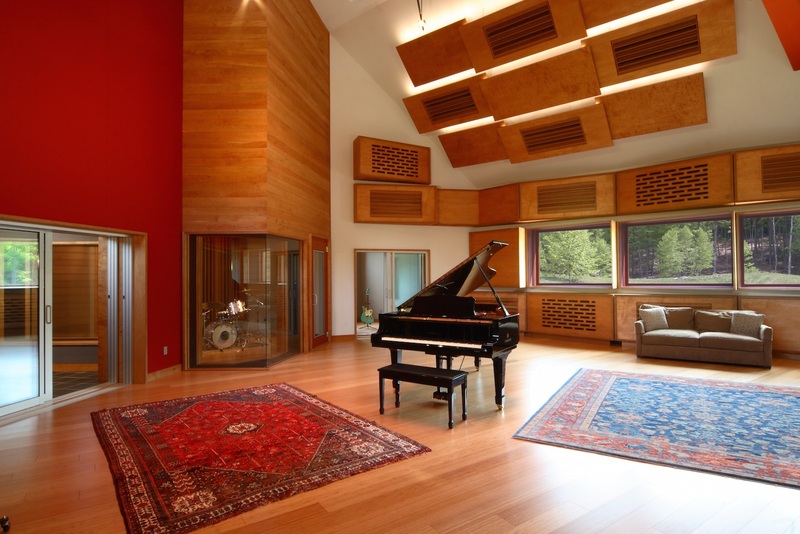 Guilford Sound is an energy efficient residential recording facility located on over 300 acres of private woodlands, designed to be a haven for those looking to get away from it all and focus on creating music. Guilford Sound is owned and operated by Dave Snyder, who moved to Vermont in order to pursue his dream of building a studio from the ground up—a dream that was realized by the venerable team at Francis Manzella Design. The studio sports a large live room with a "live/dead" side approach, four isolation booths featuring spring floated concrete slabs for optimal isolation between rooms, a 64-input API Legacy console with Flying Faders and a 12 channel Neve Melbourn sidecar, and a long list of equipment including drawers full of vintage microphones. There are two housing options onsite - a modern, five-suite, passive solar housing facility that sleeps 5-10 (either a king in each suite or two twins), and a restored three-season historic 1790's farmhouse that has five bedrooms and two shared baths.